Web traffic and referrals are great, but do you have the latest tools to handle leads? Your business is trying to tell you something. Either you’re about to have the best real estate fall you’ve ever seen or you’ve got some serious work to do to stay afloat. Tomorrow’s clients are today’s Web visitors. Check your Trulia profile and other Web analytics to get a handle on your traffic trends. If you’re seeing more or stable Web views, you’re likely in good shape. If things are taking a dip, it may be time to blog, share, or create other content that gives real estate lurkers a reason to stop by your profile or website. According to NAR’s 2013 Profile of Home Buyers and Sellers, nearly half of agents were chosen based on a referral. That means prospects aren’t the only ones you should be nurturing. Whether they are anniversary cards, neighborhood updates or home valuation reports, if you’re staying in touch then you’re on track to have a great fall. One of the biggest real estate lessons of the past few years is that change is really the only constant in the life — and business. That means you should always be looking for new ways to ensure your business’s future. If you’re experimenting with new cutting-edge products like Trulia Seller Ads and other tools that help you track your marketing return on investment and generate high-quality leads, you’re headed in the right direction. Online lead generation is a must, but your marketing mix should include some community face time. Whether it’s PTA meetings, golf tournaments or other events that bring your community together, get out there and show face. This has two major benefits: Your prospects will feel more connected when they see your ads or emails, and you can farm content for sharing online that reinforces your position as the neighborhood expert. Trulia for Agents app for instant alerts and fast replies. Apptivo, Base or Market Leader for lead tracking that fits your budget. Happy Grasshopper for easy follow-up emails that convert clients. 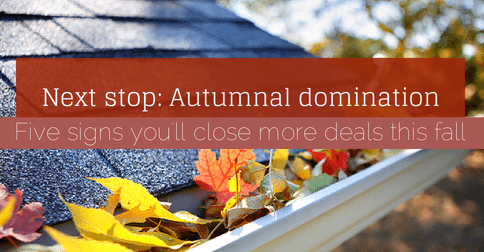 These five signs mean more deals this fall, but they aren’t the only ones. What signs do you see that usually mean you have a great season ahead?